Hey guys! 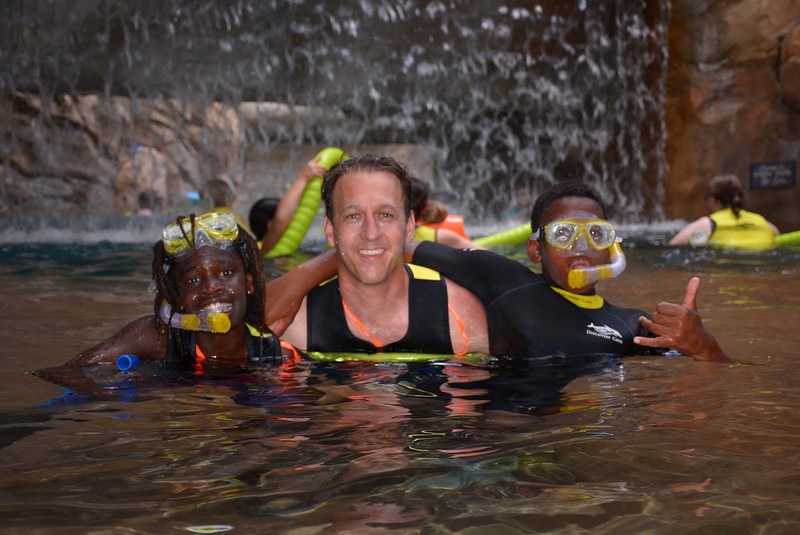 My husband is taking over the blog today, to talk about his recent trip to Discovery Cove. Life at home can feel crazy busy trying to balancing work and family time. Due to the nature of our busy schedules and having four kids I often feel like we have to divide and conquer to maximize time with the kids. I enjoy taking the girls on daddy daughter dates as well as taking father/son adventure days with my boys. In that spirit, we’ve done all kinds of creative outings. However, I think this last weekend was my very favorite boys’ trip thus far. The reason I make this distinction is because the adventure we went on allowed me to have as much (or more) fun as the kids. I typically have fun at all of these excursions with the kids, however, there was something about this particular location and experience that reawakened an inner childhood passion and joy within me. And that as such an amazing experience to have with my sons. 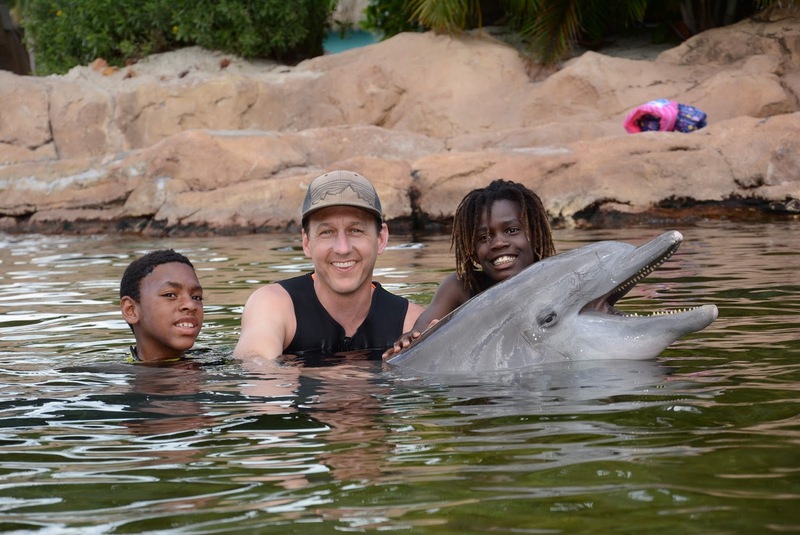 Kembe (who’s 9) and Jafta (11) and I went to Discovery Cove Orlando. Discovery Cove is my new favorite family activity in Orlando. 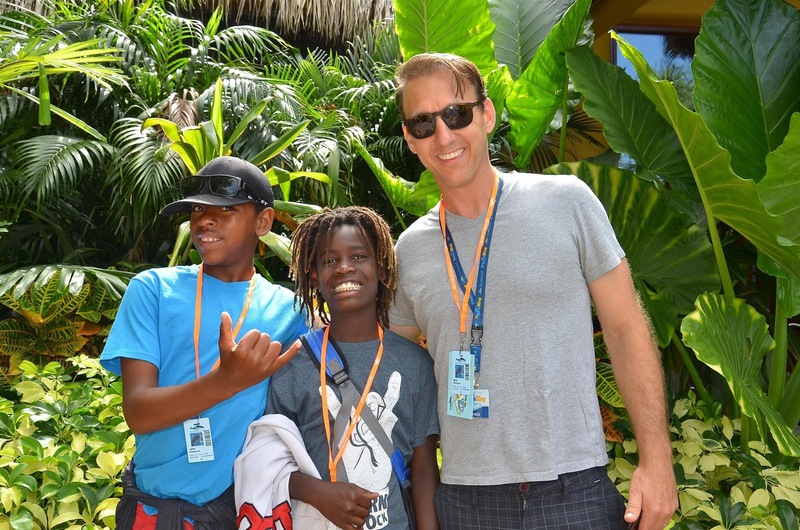 Seemingly, there are limitless amusement opportunities for families in Central Florida and we’ve done a lot of them, but I just fell in love with Discovery Cove. To be honest, I hadn’t even heard about it and feel like I have discovered a hidden gem. This place was amazing. It reawakened my love for the ocean and my curiosity for the beautiful animals that inhabit it. At the same time, I saw my boys become mesmerized with the wonder of this very same beauty. Discovery Cove is a unique combination of an interactive aquarium and inspirational, hands-on learning experience that successfully peaks the participants curiosity in fascination about sea life. There is a massive snorkeling area with huge stingrays large tropical fish and other unique marine life. There is a bird aviary and observation area where you can watch sea otter and cute little monkeys called marmoset. But the centerpiece of Discovery Cove is the Dolphin Lagoon, an interactive experience with dolphins. This once-in-a-lifetime dolphin encounter was truly magical. The Grand Reef For us, we started by snorkeling with the stingrays in the interactive bay called The Grand Reef. Swimming this close to these giant sea creatures was thrilling. Not to mention the excitement of swimming through schools of fish with their bright colors and various sizes. Needless to say, the boys were pumped. The Boys were snorkel’d up and ready to go! This is the Grand Reef, where we swam with sting rays and tropical fish Jafta and I snorkeling in The Wind-Away River at Discovery Cove (Thanks www.myboysandtheirtoys.com for the picture!) 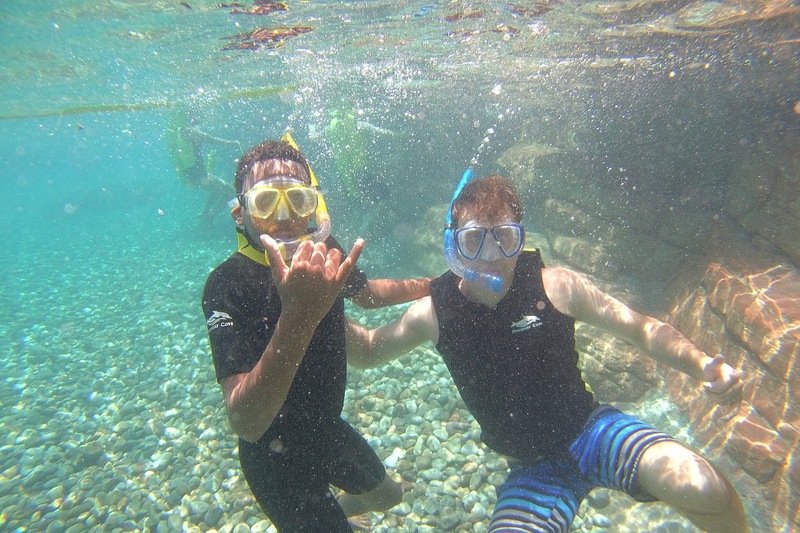 The opportunity to snorkel, play and discover with my sons was a wonderful treat. Another nice thing about Discovery Cove is that everything is included! All you need to bring is your swimsuit. They provide your mask and snorkel, sunscreen, wetsuit or vest, towels, life jackets (if needed) AND all your food and drinks for the day! This level of service adds so much to the freedom to just show up and enjoy the sea life experience unencumbered. Dolphin Lagoon And then it was our turn for the Dolphin Lagoon, which was epic. As if swimming with stingrays and floating through schools of tropical fish wasn’t enough, interacting with these dolphins absolutely took me to an inner-child blissful place. I know the boys loved it equally as much. I was so happy to experience it with them. 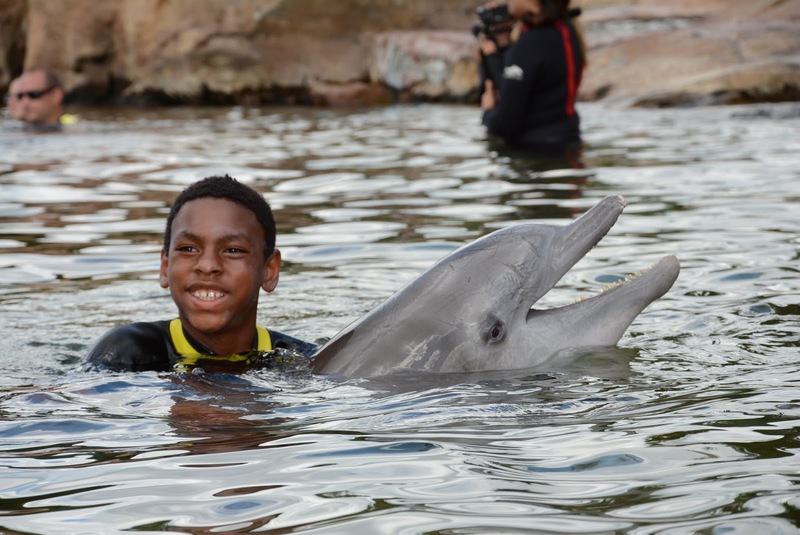 (One side note the, children have to be at least six years old to participate in the Dolphin Lagoon experience.) It was so great to experience this moment together. Holy moly!! 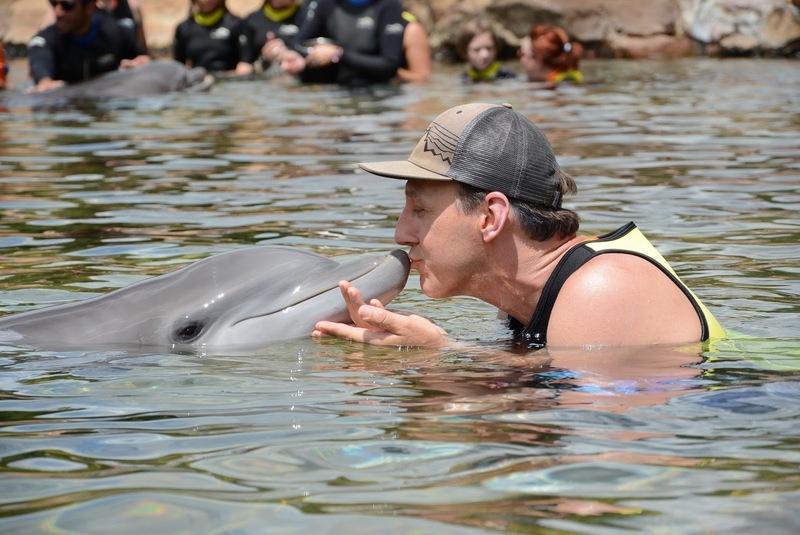 I got to kiss a dolphin! This is ‘Reef’, she is a 1yr old Atlantic Bottlenose dolphins. 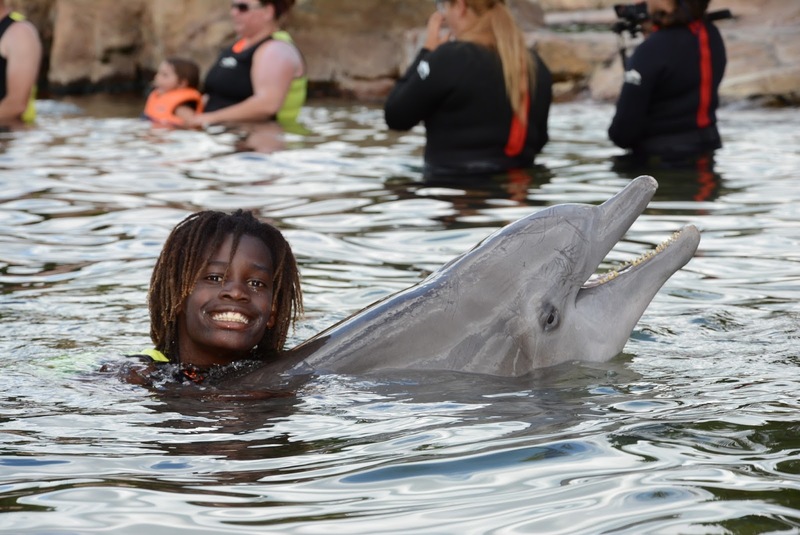 Jafta loved every minute of observing and interacting with all of the wonderful animals at Discovery Cove. Kembe was feeling a bit nervous at first, but was so happy that he pushed past his concerns and swam with the dolphin Explorer’s Aviary After the Dolphin Lagoon experience, we went into the Explorer’s Aviary to check out the tropical birds. We had no expectations walking in, so imagine our surprise when we were handed little cups of bird food and had the opportunity to feed the birds. Again, I was so impressed that there were opportunities to interact with the animals in so many different ways. 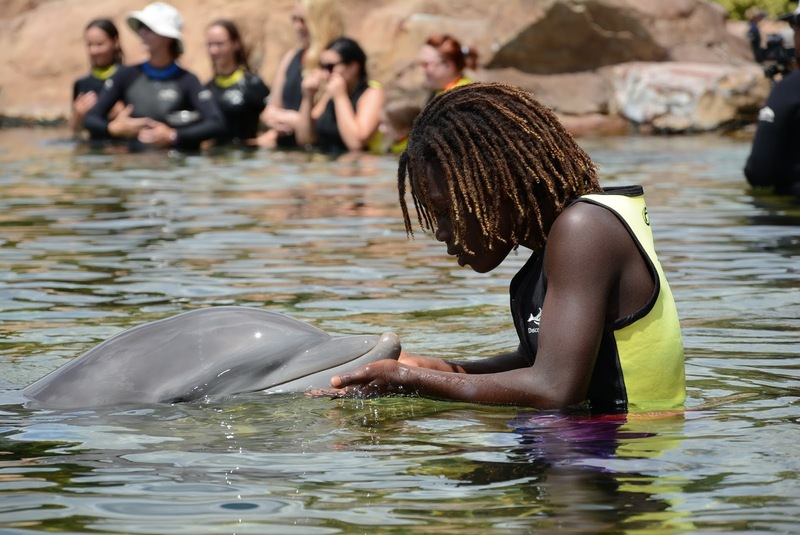 It seems like a cornerstone of Discovery Cove is to engage with animals in a way that increases curiosity, empathy, and appreciation for all living things. I think that are doing a excellent job at going beyond entertainment and consumerism and genuinely providing opportunities for inspiration and education. 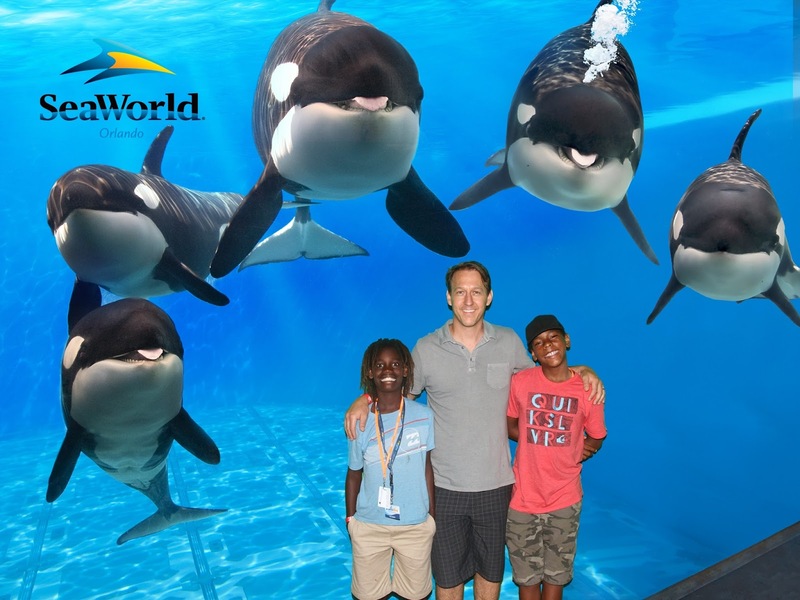 The second day of our adventure took us to Sea World Orlando and we had a blast. In many ways this experience is very different with my boys because they were very excited to go on all the roller coasters and rides. Sea World has some very impressive roller coasters. I had not been to Sea World since I was a little boy and hadn’t realized that they have develop so many great roller coasters at the park. They were really fun. 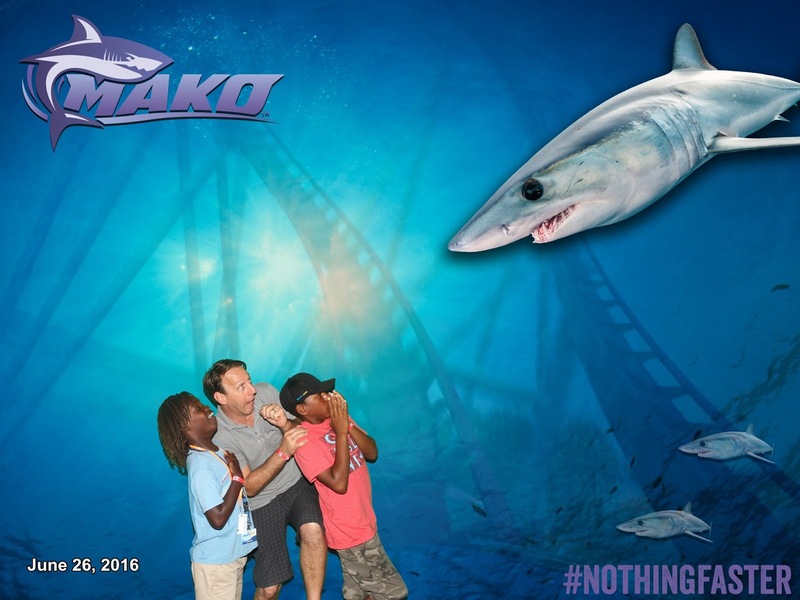 Mako is the newest ride at Sea World and boasts being the longest and fastest roller coaster in Central Florida My boys loved the Shark Reef Encounter As impressive as the roller coasters were, I was equally impressed with what seems like the greater mission that Sea World has, and that is their focus on animal rescue and conservation. We had the unique opportunity to hear from several of Sea World’s executives and educators and a consistent theme I heard was the was impact that Sea World had on them as children that led them into career of working with the organization. As I listened, I remembered what an impact Sea World had on me as a child in creating my love for nature and specifically, the ocean. It seems that application for caring for sea life is a driving force for Sea World. This is the sea turtle section of the animal rehabilitation center at Sea World Orlando I did not know that Sea World was such a presence in animal rescue and rehabilitation. In many ways, Sea World is like the Red Cross to the ocean and its animals. They rescue so many animals through out the year is averages out to about seven animal rescues a day. In addition to rescuing, rehabilitating, and releasing animals, they are trying to change the way that humans experience animals in the first place. Through a program called Rising Tide, they are focusing on protecting fish in the Ocean and specifically protecting natural reefs. For example I learned that “Nearly all marine aquarium fish – about 98% – are harvested from the wild because reliable protocols for the aquaculture of marine fish have not been developed and shared throughout the industry.” Obviously, that harvesting has an impact on the natural ecosystem of the already endangered coral reefs. While we were at discovery Cove and Sea World, we have the opportunity to participate in helping to harvest fish eggs from the tropical fish who live in the waters at Discovery Cove in order to increase the success of breeding tropical fish. These efforts will mean that more fish can be successfully raised so that fewer fish would be harvested from the wild. I appreciate this conservation focus and was happy to hear this: “SeaWorld has committed $50 million over the next five years to be the world’s leading marine animal rescue organization, to advocate for an end to the commercial killing of whales and seals and an end to shark finning.” https://seaworldcares.com/Future/ The last generation of Killer Whales at Sea World Lastly, in light of the controversy and concern over the last few years with breeding and maintaining Orcas in captivity Sea World has responded by saying “We are listening.” They have stated that the 29 orca’s that they have in captivity will be the last generation of Killer Whales at Sea World. Additionally, they have ended the Orca breeding program and will no longer breed Killer Whales in captivity. I grew up seeing the Shamu Show at Sea World in San Diego, and I still remember the how exciting that show was. However, I affirm and agree with this decision. It simply does not seem like an option to continue to keep these majestic creatures in captivity. And I’m looking forward to the creative ways that Sea World will continue to inspire and educate young (and old) minds on the wonder and beauty of Killer Whales, and all of the beautiful creatures of the ocean. Based on my experience this trip, I am confident they will.